90mm x 230mm newel caps to suit double newel posts. These pyramid newel caps have clean edges and a simple but stylish design. They are designed to easily finish a double newel post in a subtle but appealing way. Double newel caps are typically used when two newel posts have been positioned next to each other for a particular design of staircase. They provide a quick and effective way to finish the double newel posts while maintaining a coherent look across the staircase design. Pyramid double newel caps provide a simple but effective design choice to finish double square newel posts. 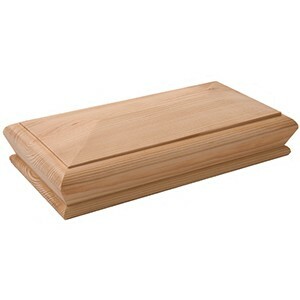 They are available in a choice of woods, to suit your stair design and the style of your home. We also supply these double caps in different sizes with a recess that will exactly fit your double newel.